Stark coastline. Somber sky. The Scottish scenery echoes the simple, serious storytelling in TOMMY’S HONOUR. The true story of celebrated golfer Tommy Morris and the beginnings of the modern game of golf we know today, TOMMY’S HONOUR stars Peter Mullan (BRAVE HEART, WAR HORSE) as Old Tommy and Jack Lowden (DUNKIRK, '71) as Young Tommy. The Victorian-era story follows “Young” Tommy Morris, son of noted Scottish golf caddy and greens-keeper “Old” Tommy Morris. With a natural knack for the game, Young Tommy sets his sights on a golf career beyond his father’s life of caddying – to be a golf pro. Both decorated players in their time, the Morris family men made a significant impact on the way that golf is played today. The film already won the BAFTA Scotland Award for Best Feature Film. I won’t make many golf references in this review because I don’t know much about golf. My perspective on this story is not from golf fandom, just one of a story-lover and someone prone to crying during dramatic sports movies. 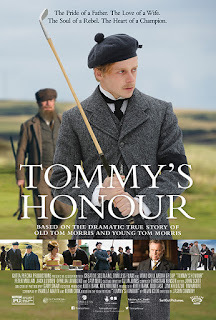 But the high drama in TOMMY’S HONOUR (yes, I did cry) wasn’t on the golf course. Instead, the movie’s most climactic events are from Tommy’s personal struggles. Old Tommy pressures his son to follow in his footsteps, expecting him to take his place as club greens-keeper. His son’s aspirations to climb the ranks are an embarrassment. The father and son duo make a great golf team, but their differing views on Young Tommy’s future cause conflict. Tommy’s mother is strict and serious, her rigid religious beliefs are at odds with Young Tommy’s passionate way of life especially when it comes to his love life. Young Tommy’s love interest, played by Ophelia Lovibond (GUARDIANS OF THE GALAXY, MR. POPPER’S PENGUINS), is kind and genuine. In spite of their age difference and her complicated past their relationship is strong, to the chagrin of Tommy’s mother. The struggle I found most intriguing was the culture clash between the traditional upper-class Scottish golfers and the alleged lower-class workers like Young and Old Tommy. While Old Tommy accepted his position of servitude, Young Tommy could not accept the status quo and even burst into the clubhouse reserved for members only (gasp!). The tension between the young golfer and the establishment only makes you want to pull harder for Young Tommy. There’s plenty of golf course action too. Lots of “double or nothing” bets and botched putts on the green. Some amusing detours show the small but significant ways that the Morris family affected the game of golf – a wild idea to carry your set of clubs in a bag, for example. The cast is solid. Lowden is charming and personable as Young Tommy. Mullan is equally strong and believable as Old Tommy. Director Jason Connery (SHANGHAI NOON) – son of Sean Connery – keeps a slow but consistent pace. Learned much history of golf, golf balls, and clubs. But most of all, gained knowledge of the men and families that made a great sport that it is today.